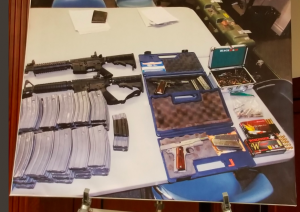 A school police officer in South Whittier says he was just doing his job when he reported a threat of a school shooting that led to the discovery of a cache of weapons. “I see him as kind of the unsung hero of this whole thing,” said L.A. County Sheriff Jim McDonnell about El Camino High School Safety Officer Marino Chavez. McDonnell said on Feb. 16, Officer Chavez overheard the student making the threat, reported it to administrators and Sheriff’s deputies who then searched the boy’s home in Norwalk. “At that location, they found two AR-15 rifles, two handguns and 90 high capacity magazines,” said McDonnell. The boy’s 28-year-old older brother was also arrested for illegally possessing those guns and having unregistered firearms. McDonnell is encouraging the public to not be afraid of reporting threats or anything suspicious, especially after the recent school shooting in Florida.